Because we love alliteration here, meet Aloysius “Alois” Alzheimer, born June 14, 1864 in Marktbreit, Bavaria, Southern Germany. He excelled in the sciences at school, where he studied medicine in Berlin. First at Ashaffenburg (no, it’s not a chocolate), Tubingen then Wurzburg, where he graduated with a medical degree. Another noted neurologist, Franz Nissl, began work in the same asylum with Alzheimer. They worked together on a major six volume study, the “Histologic and Histopathologic Studies of the Cerebral Cortex,” describing the pathology of the nervous system. 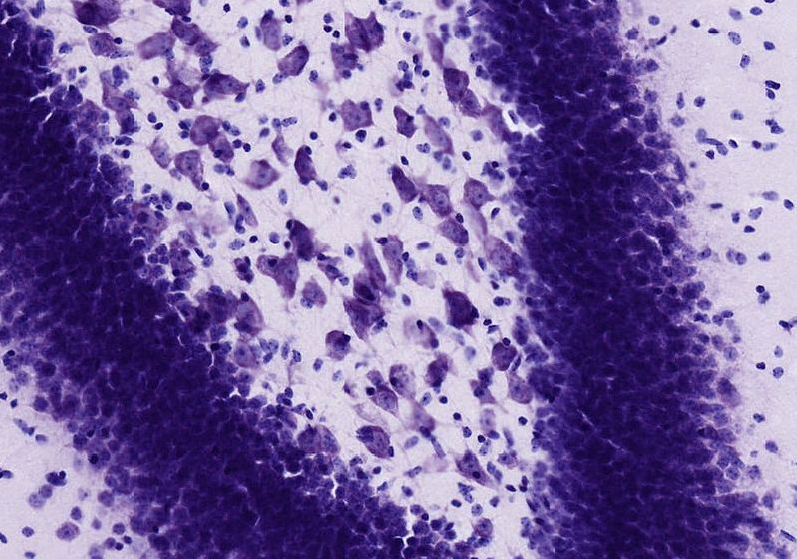 Much of Alzheimer’s later work on brain pathology made use of Nissl’s method of silver staining of the histolological sections. By 1901, Dr. Alzheimer noticed a patient at the asylum named, Auguste Deter. She was 51-years-old and exhibited strange behavioral symptoms, which included short-term memory loss. She showed signs of disorientation, hallucinations—symptoms previously only encountered in the elderly. She would become his obsession. In 1903 he became the research assistant to Emil Kreapelin at the Munich Medical School. Once there, he created a new laboratory for brain research. In 1906 at the age of 55, Mrs. Deter died and the asylum sent Dr. Alzheimer her medical records and her brain. The post-mortem analysis of her brain displayed various abnormalities. Because of Alzheimer’s access to the Nissl stain, he was able to identify the senile plaque along with neurofibrillary tangles which had never before been described. It was his speech on this finding on November 3, 1906, which was the first time ‘presenile’ dementia, as he called it, was described. And Kreapelin published a textbook calling the condition Alzheimer’s Disease which made Alzheimer’s name famous. By 1911 European physicians were using Alzheimer’s description of the disease to diagnose patients in the U.S. He died on December 19, 1915 at the age of 51 from a heart attack caused by complications of catching a severe cold on a train to Bresalu, Silesia, Prussia (now called Wroclaw, Poland) while traveling to take up a new research position. He is buried next to his wife, Cecile, in the Hauptfriedhof in Frankfurt am Main. 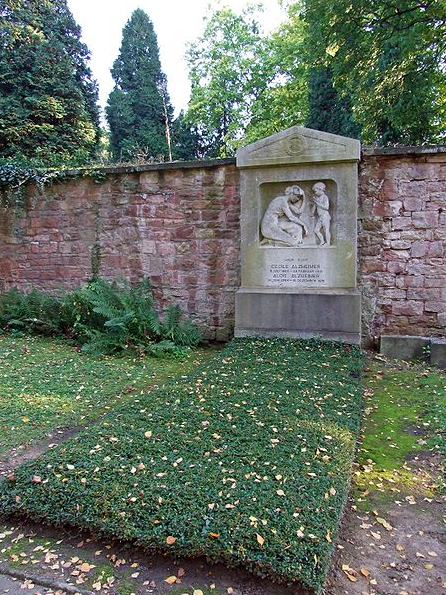 The Alzheimers’ grave in Frankfurt am Main. Today, the pathological diagnosis of Alzheimer’s disease is still generally based on the same investigative methods used in 1906. Considering the advancements in modern medicine in the last hundred years, that says something about the detail of his work. This entry was posted in funny names in science and tagged Alzheimer, funny names, germany, histology. Bookmark the permalink. Hahaha. I hadn’t even thought of that. The man behind the discovery of the disease. 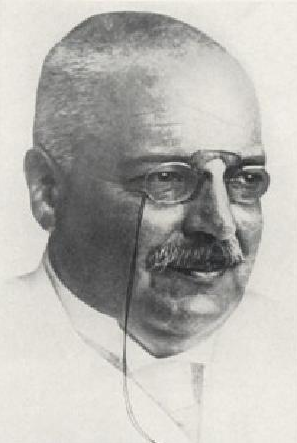 Meet Alois Alzheimer, this month’s contribution to the Blog of Funny Names. When you said that thing about the neurofibrillary tangles, I have to say I know exactly what you’re talking about, Fannie! Don’t you hate it when your neurofibrillaries get all tangled? It’s literally the worst! Oh lordie me, what a mess. Great choice of topic! We love our Aloysiuses around here. And who doesn’t love some Aloysious in the morning? Fanny, I can’t express how much I love you for talking about neurofibrillary tangles and Nissl stains! This is my favorite type of scientific research – great choice for a subject! And I somehow overlooked that caption initially – I studied neurons and glia in the hippocampus! Arto can tell you all about it (or at least a little bit about it). Now that’s a conversation I’d look forward to! But I’ll bring a copy of the Grey’s Anatomy coloring book and a purple crayon. And I think I can say glia without getting into trouble. It is a four letter word after all. Yes, I can tell you he did that! Need to learn is certainly there, actual learning still out to lunch somewhere. Patience – well, where would a doctor be without patience? Unemployed! Ha! trying to play up to the boss man, Fannie, what with the brain-related topic and all? angling for a raise? haha, you done good. Never even thought to think why Alzheimer’s is called Alzheimer’s. Now I know thanks to you and your most excellent research. Hope it all means you’re feeling much better. I did throw in a chocolate reference for you and Amb though. Yes, I’m getting better. No voice yet. I sound like a bull frog barbershop quartet without the harmony. Can’t wait to see what you come up with next week. Psst. Liz. We could do a funny name/funny food Oscar winner recap thing … my people will call your people. We’ll talk! I like it. Next up, Lupita Ny’ongoulash. I heart you, have I told you that lately? !